I used the German Birthday and Party sentiment collection from Whiff of Joy Stamps as the center of a huge spring flower. It means "Cheers to you" and I cut the text with my round petite Nestabilities from Spellbinders. All the borders are distressed. Thanks for your visit and enjoy the evening!! Ich habe die deutschen Party- und Geburtstagstexte von Whiff of Joy Stamps als Mittelpunkt einer Frühlingsblume verwendet. 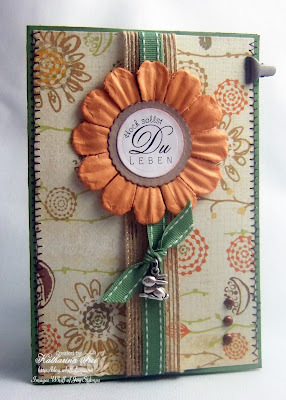 Ausgeschnitten habe ich den Text mit den round petite Nestabilities from Spellbinders. Alle Kanten sind mit einem braunen Stempelkissen gewischt. beautiful card Katharina, I hope your 'men' are better soon! Such a lovely card! That flower is beautiful and your dp is perfect. Love those colours. Hope your men are better soon. beautiful card Hun, a wonderful idea to use the sentiment a the centre of your flower.love the addition of your charm, adorable. "Simple" but so beautiful card! So gorgeous with the sentiment in the middle of the flower! Hope that your "men" will be fine soon! Take good care of them! oh! I really like this card. I like how you wind both of the ribbon around. I love that bunny charm, so adorable! This is lovely & the little rabbit charm is so cute! Hope your men are better soon. Kirsten. I like this flower card! Very nice! I hope your "men" are feeling better soon! Beautiful card! I hope the guys are feeling better soon! My little one was sick last week as well...it's not fun! Beautiful card, what wonderful papers and colours. I love that you've used the sentiment in the middle of the flower as your main image - inspired. Wunderschönes Papier und eine tolle Farbauswahl hast du getroffen. Lovely card Katharina, I hope your men will feel better soon. hope the men in your house are feeling better by now. Hallo Katharina, erstmal gute Besserung an deine Männer! Hi Katharins, hope your men get better soon. Just love your creations and the colours are beautiful.